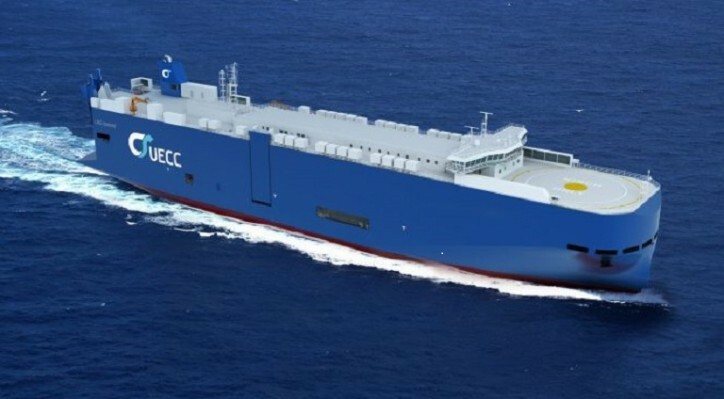 United European Car Carriers (UECC), jointly owned by Nippon Yusen Kabushiki Kaisha (NYK) and Wallenius Lines, has signed a contract to construct two new generation PCTC with China Ship Building Trading Co., Ltd and Jiangnan Shipyard Group Co. Ltd. The newbuilding contract also has options for two additional vessels, and the first vessel is planned for delivery in 2021. The vessels will be equipped with a Battery Hybrid LNG Solution which will place UECC beyond IMO’s target for a 40 percent reduction in carbon intensity by 2030. “This is a giant leap towards decarbonization, and unlike anything else that has been done previously in our industry, I believe, and something that we are extremely proud of” stated UECC’s CEO, Glenn Edvardsen. The vessels will have a length overall of 169 meters, a width of 28 meters and a car carrying capacity of 3 600 units on 10 cargo decks, of which 2 decks are hoistable. This will make the vessels extremely flexible enabling them to accommodate a multitude of high & heavy and break-bulk mafi cargoes, which are cargo segments, in addition to the cars, that UECC has built a significant portfolio of over the years. The vessels will have a quarter ramp of 160 metric tons safe working load and a side ramp of 20 metric tons safe working load and can accommodate cargo units up to 5.2 meters high. To ensure a significant reduction in the environmental footprint, UECC, Jiangnan Shipyard and leading ship Designer Shanghai Merchant Ship Design & Research Institute (SDARI) will build the PCTCs according to some of the most innovative and the latest energy efficiency criteria. The vessels will meet the Tier 3 IMO NOx emission limitations coming into force the Baltic and the North Sea from 2021. In respect of the 2021 CO2 reduction regulations, the vessels will also be equipped with dual-fuel LNG engines for main propulsion and auxiliaries. "The environment is at the top of UECC's agenda” said Edvardsen. UECC’s Head of Ship Management, Jan Thore Foss, added “UECC's experience with LNG PCTCs has been very good and there was really no other alternative for us” and added “the LNG solution will reduce the CO2 emission by about 25 percent”. To make the vessels even more environmentally friendly and to cut CO2 emissions further, the vessels will also be equipped with battery packages. "We are investing in the future," underlines Edvardsen” and added "Our solution will take us beyond IMO’s target for a 40 percent reduction in carbon intensity by 2030”. As more bio fuels are set to become commercially available in the future, UECC aims to also use carbon neutral and synthetic fuels as part of our future fuel mix. "In our strategy we take a long-term view," said Edvardsen, “and that's why we go for a battery hybrid LNG fuel solution on our new buildings”. UECC’s CEO, Glenn Edvardsen, concluded with the following statement: “UECC has again taken leadership, and responded to future environmental regulations and market demands, with technological innovation, quality and sustainability and we will continue to do so. Furthermore, we will exceed current and future environmental regulations”.